(Deutsch) Im Zug nach Chemnitz II oder: warum ich “Horst” fast ein bisschen dankbar bin. 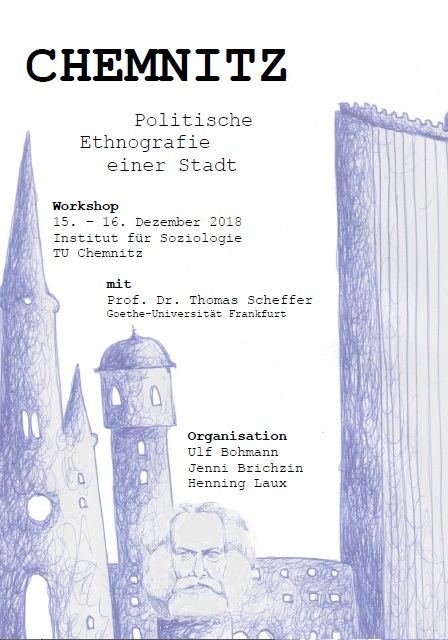 To mark the occasion, we are launching a small local cooperation project in Chemnitz on the question of how the political – between right and left and beyond – manifests itself in public space: “Chemnitz – political ethnography of a city” (the picture announces the opening workshop). We’ve already done a few initial observation tours through the city – it’ll be exciting, I’m really looking forward to it! I’m sure there’s always something to report in between. This year we published the anthology “Sociology of Parliaments” (series Political Sociology Springer VS), now I am setting out – together with Jasmin Siri – on a new collective publication project: We want look for new sociological perspectives on parties with a book on “Sociology of the Parties”! We think that this is a good time to do just that. As with the book on parliaments, we want to lure sociology out of its reserve, as it traditionally concerns itself only marginally with political institutions, and even the dialogue with political science is rather sporadic. There’s more to it, we think – let’s see what comes next! Since October I am now working at the Institute for Sociology at the TU Chemnitz. There are many reasons why I think it’s wonderful, but we don’t have much time here. On occasion I will certainly tell you one or two stories – for example about my train journeys here, which have often been very peculiar. But now it’s time to start!